Do Ya Wanna Dance ??? We are looking for an even number of guys and gals to learn some rock and roll singles dances and couples dances for a revue group. This is not a paid event; however I am happy to train even non dancers up for this event at a small cost per lesson. All the moves you will learn are basic rock and roll moves and will enhance any other dancing style you may have or are thinking of embarking on. I have been dancing since I was 5 and training competition dancers for nearly 30 years. The idea is to have as many dancers learning all the routines, giving us a core number that are available at any one time. We all live very busy lives and itâ��s important that youâ��re learning can take place when you are least pressured. The Blues brother had about 20 people but not all of them were available to dance at a function at one time. So we had always enough to do the show when we had an invite. This review is guaranteed to lift your spirits, tone up the tummy muscles and tighten the tush. You also will be learning fantastic routines that you can dance to any music with or without a partner. 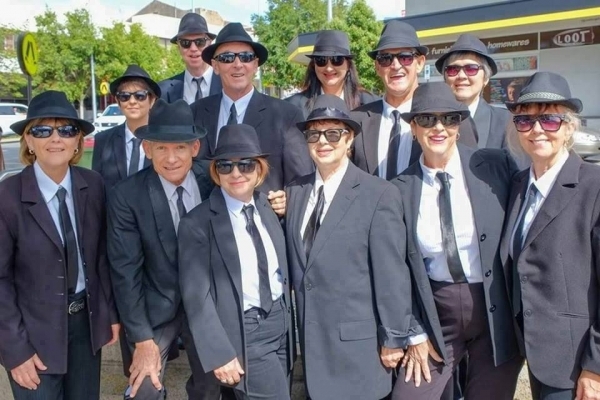 Come and join the Blues Brothers Revival Revue Team and have a lot of fun learning to dance.